My mother used to tell me if I didn’t have anything nice to say don't say anything at all. So here goes. The Altai are frickin’ gorgeous! Growing as they do out of the fields of sunflowers in the rest of Europe they come as an invigorating surprise. The rolling foothills gradually become full sized mountains with some of the most impressive glacial landscape that anyone can imagine. The huge valley torn and formed by the mineral-green Katun and Chuya rivers brings delight and change at every turn. Sweeping moraines and eskers form a foreground for rugged hills with smoothly carved vales, their blends of reds, greens and browns transmuting by the moment. The excellent road climbs steadily and eventually reaches a vast, high plateau that borders Russia, Kazakhstan, Mongolia and China. Hiking four countries in a single holiday may one day be possible, but given the size of the local radar installation with its extra passport control point it’s unlikely to be soon. Pausing only long enough to build a stone cairn to honor those we love and snap a few photos we zoomed towards Tashanta and the border with Mongolia. A team from the Netherlands, the Dapp’re Strijders, coming the opposite way beeped us and we pulled over. Dominic, Anne-Marie and Iwo had just met the Fast and the Furry (a Danish team) and both cars had arrived too late to cross that day. So they were heading back to the village for cash and a bite to eat. We said we’d probably catch up with them, but wanted to have a look at the border anyway. The border was indeed closed when we got there. Another double back found us late for a date with a bottle of beer and supper. 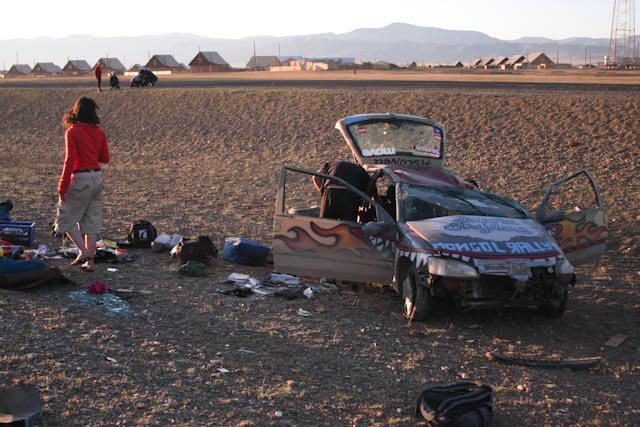 About 700 meters from where we had first met the Dutch team we had a communal moment of “there but for the grace of G.. go I.” Their Peugeot sat crushed and ruined amongst a field of debris stretching for yards in all directions. Onlookers watched as Anne-Marie attempted to stitch a gash in Iwo’s knee, while Dominic wandered around making phone calls. That these three were alive and almost unhurt is either a miracle or a testimony to Peugeot’s engineers. Reluctantly pulling the medical kit from Swifty’s boot, we examined the troops, dressed their wounds and were amazed at their sang-froid. 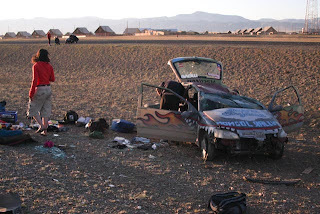 It was the silliest of faultless accidents, but without a car the team faced a series of logistical challenges, not least of which was how to reach Ulaanbaatar and how not to pay a huge fine for abandoning their car in Russia. The title "Crashing at the border" just made put my heart in my throat. I am glad everyone is alive but DON'T DO THAT!!!! Yikes! I am glad all that training came in handy. (Well not glad but you know what I mean). All are well and doing fine. We're waiting on the Dutch to get into Ulaanbaatar and find out how the rest of their trip went. We'll update with more shortly.